little bits and pieces of our baby girl's room are slowly coming together. 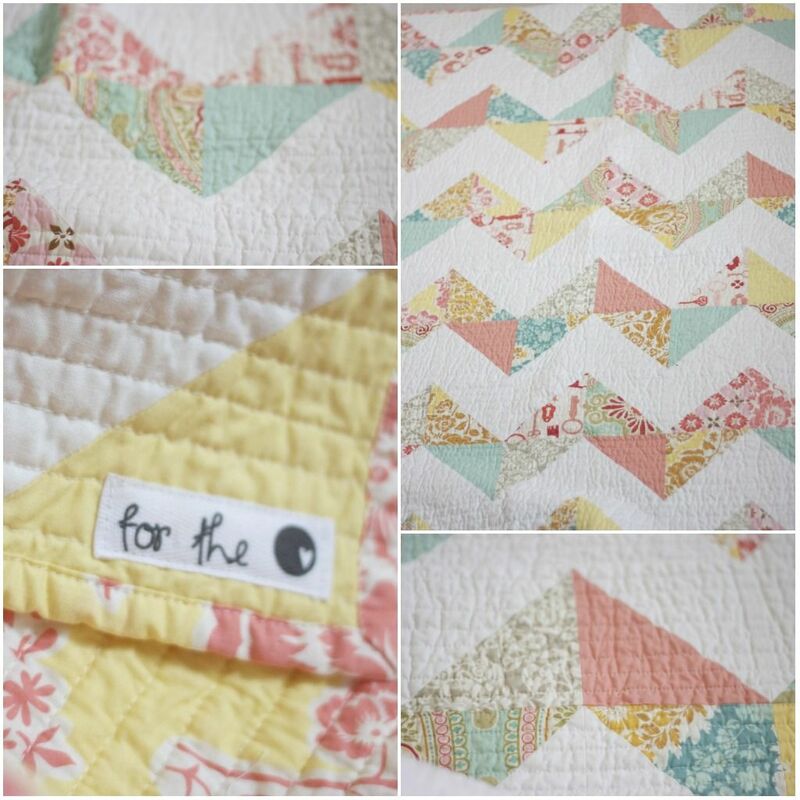 lu, from for the love designs, made this quilt for our sweet girl and i couldn't love it any more than i already do. 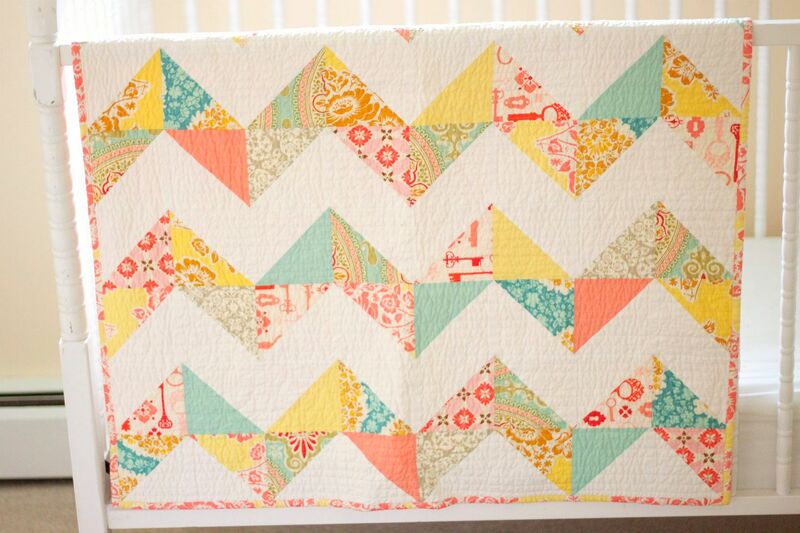 my love for this design and quilt all started a long while ago when i saw this quilt on etsy. i wanted it SO badly…and still do, maybe even more so now that i've seen our girl's. well, when i found out the bean growing inside me was indeed a female, i knew who would be making her bedding right then and there. i asked lu to create a quilt just like the one i love so much, only crib size, and changing the colors a bit to suit her room. she used my pinterest board, we're having a girl, for color inspiration. the colors! oh, the colors. be still my beating heart. our girl's quilt is made so beautifully and with so much love. i almost cried when i opened it. i can already imagine her sweet baby self sleeping covered with it, and then when she's a little older, cuddled under her quilt on the couch with her brothers. oh, i think she will treasure this beauty for years and years. i love it so much that i sometimes wish it was queen size and our own bed. thank you so much, lovely lu, for all the time, work, and love you put into making her quilt! it's hard to tell in the pictures but her room is now painted, a fresh and light peach. it makes me want to lick the walls. the "butler" mirror, that i got for $3 at a garage sale, has been spray painted one of my favorite colors and is holding some of baby girl's headbands. some of sweet piper's big girl shoes passed down for our girl. and target clearance rack clothes… just need to be washed and put in her dresser. 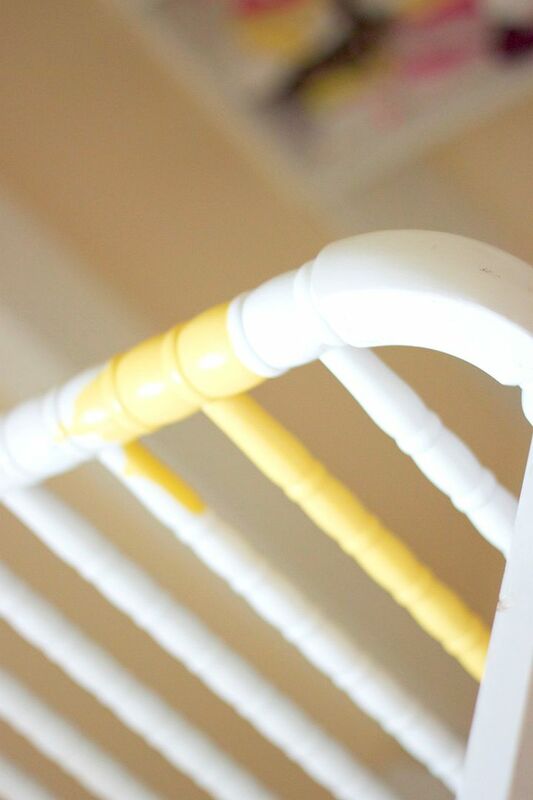 debating whether or not this is the exact shade of yellow i want for her jenny lind craigslist crib. 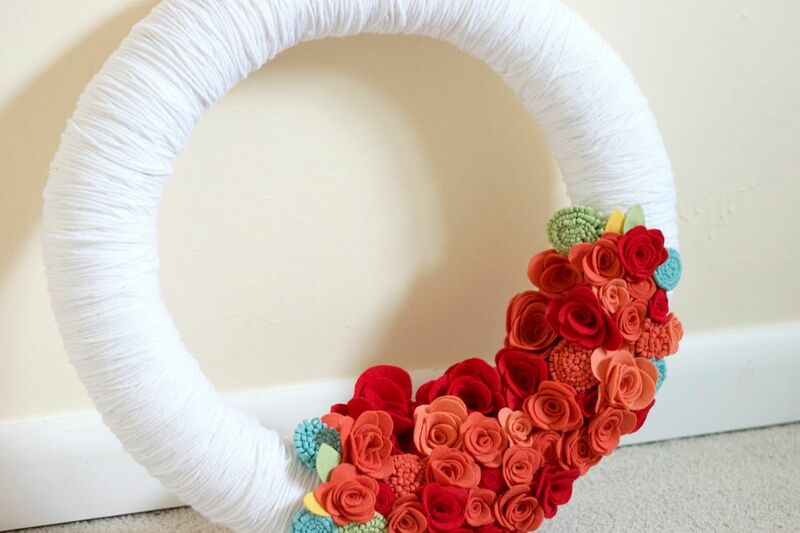 my very wreath that was featured in stitch craft create will be hanging in her room as well. and, guess what? my friend anna joy is working on her name pillow. which means we have decided! about time, right? there's no going back now. i would tell you her name now but then i'd have to kill you. but, i mean, seriously. i ain't telling. loving these peeks at the sweet details! happy, precious things. praying and praying. and i need to get elijah a name pillow before he's grown! ha! i REALLLLYYYYYY want a quilt!!!! Can I live here? This makes my heart SO FULL. It also makes me see there is much I want different in my own life. I YEARN for your family, your friendship (in a real life way) and ALL THIS BEAUTY. You are a MOST WONDERFUL momma. Danielle, I LOVE that quilt. Can't wait to see the room it all its girlie glory - and "meet" the little babe!! Gorgeous quilt! And it's HARD to find the right shade of yellow! Seems like a silly problem, but the angst is real. Similar stuff going on with my lu's room, which is too much of a disaster to document. Anyway, love errrything so far. So beautiful, Danielle!!! I love everything about the room! If Lucia had a nursery of her own, that is exactly what I would want it to look like. She has the same Jenny Lind crib in white (also found on Craigslist, the best online store in the world!!!!!) and now you're making me want to paint it yellow. So cute! I LOVE that wreath and that quilt is just stunning!! I can not wait to see her room one everything is all finished!! I am sure it is going to be beautiful!! i am in love. it is beauuuutiful. beautiful!!! i'm sure her nursery will be gorgeous!! My goodness. I adore this quilt. Those colors are indeed amazing. I have been really wanting to get one made for my little toddler, I think she is just the right age to enjoy it, but If I got her one, I would need one too haha! And your wreath is stunning. I just figured out how to make the little roses, and holy cow, that must have took forever! i mean...could it be more beautiful. Love the colors!! So fresh! p.s. i feel like a cia operative since i know the name. mwhahahahaha! It's all so sweet. love decorating and dressing little girls. my mom and i just picked out the fabric for our baby girls blanket. so excited. So in LOVE with everything. The quilt is just gorgeous. The colors could not be more perfect. Loooooove the crib. P.S. Stop making my ovaries swell. The amount of baby fever that you give me on a weekly basis is out of control. everything is so lovely! i am dyyyyyying to know the name. we finally have ours... now just waiting for the due date! :) what if we picked the same thing?! I just started reading your blog. Love how your sweet one's room in looking like! 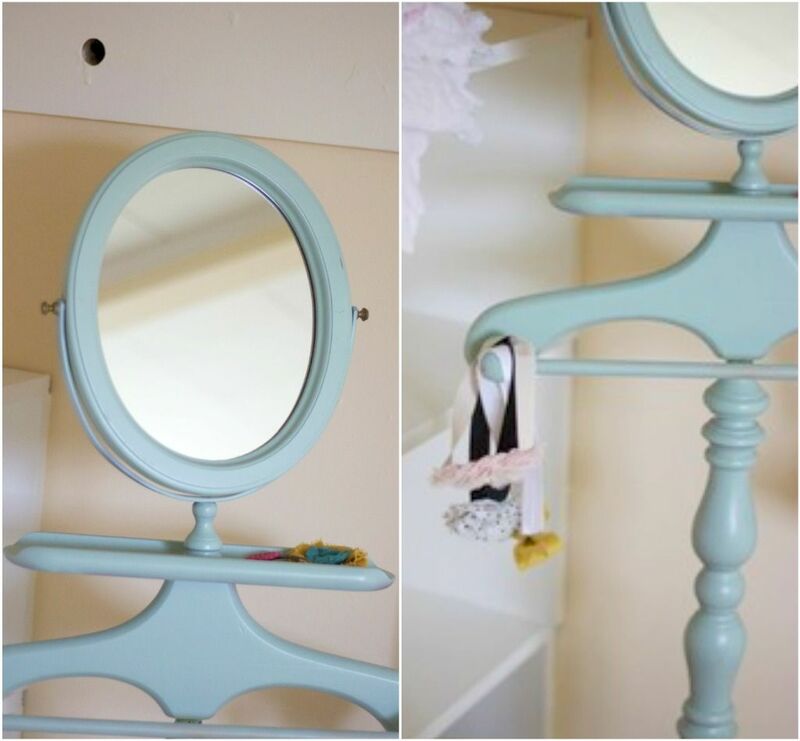 What color paint did you use for the mirror? I have been looking for the perfect color and I love that! That quilt just doubled my need to learn how to quilt! Love your little girl's room, and can't wait to find out her name!